Overlooking the bayou, you simply can’t miss Tacky Jacks’ brightly colored sign calling out your name. Tacky Jacks is an outdoor restaurant that is serving some of the best breakfast and lunch in Orange Beach since 1980. What else are they serving up? We asked Greg, the General Manager. The vibe at Tacky Jacks is a little…tacky, but in a good way. The outdoor restaurant is overlooking a marina–it’s not unusual to see people arrive by boat. The pilings and wood are all painted multiple colors to match the delightfully colorful sign. Locals will agree that grabbing breakfast at Tacky Jacks is an absolute must. The star of the menu? That would be the Farmer’s Omelet. This omelet comes equipped with everything you could ever want in an omelet: potatoes, onions, green peppers, mushrooms, sausage, ham and a blanket of both American and cheddar cheese. Ever heard of a Bushwacker? It’s a frozen alcoholic beverage that is a Gulf Coast classic. Many local watering holes and grub shops sell them, but Greg thinks Tacky Jacks is soaring above the competition. Tacky also is a great spot to watch the big games on the huge outdoor TV’s. And don’t hesitate to bring the little ones–there’s plenty of room to let loose. Serving great food and drinks wasn’t enough for Tacky Jacks–they wanted to give back to the community too. And the veterans weren’t forgotten. 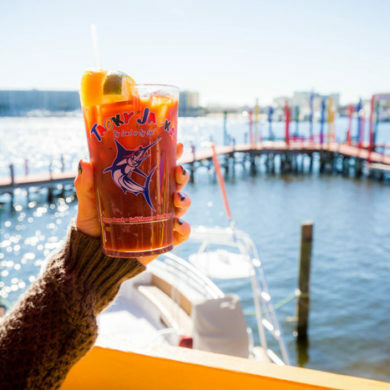 Fill up on good food and good views at Tacky Jacks. Tacky Jacks is located at 27206 Safe Harbor Dr, Orange Beach, AL. For more information, visit the Tacky Jacks website or call (251) 981-4144.